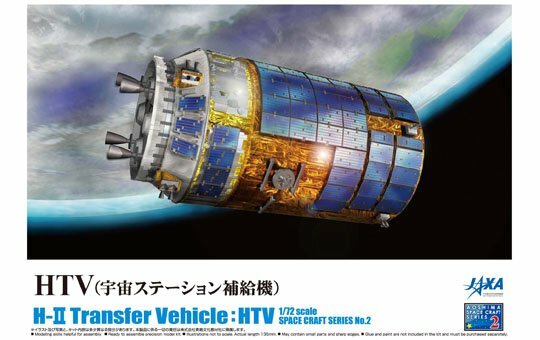 H-II TRANSFER VEHICLE: HTV. SPACE CRAFT SERIES No.2. THE HTV IS AN UNNMANED SPACECRAFT DEVELOPED BY THE JAXA. DESIGNED TO DELIVER SUPPLIES TO THE ISS AND PROVIDED WITH FUNCTIONS ALLOWING ALMOST AUTOMATIC CONTROL OF LAUNCHING TO COOMING TO A RELATIVE STOP WITH RESPECT TO THE ISS. NOW THAT THE SPACE SHUTTLE IS RETIRED FROM THE ACTIVE DUTY, THE HTV HAS GREATER IMPORTANCE.